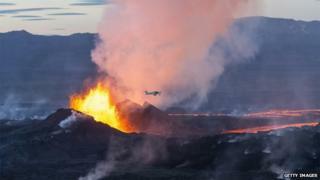 Scientists have quantified the amount of gas emitted by Iceland's spectacular Bardarbunga-Holuhraun eruption. A massive dyke drove across the landscape, starting in August last year, producing huge fountains of lava. But the six-month event also released 11 million tonnes of sulphur dioxide that spread over the country and the Atlantic Ocean towards Europe. Fortunately, the health and environmental impacts appear to have been limited. There was a spike in complaints about asthma, bronchitis and bronchiolitis, but nothing substantially out of the ordinary. "The eruption definitely left its trace on the population, and although there was an increase respiratory cases and sales of medicines – nothing extreme was reported," Sara Barsotti, from the Icelandic Meteorological Office, told BBC News. Dr Barsotti was speaking here at the European Geosciences Union General Assembly in Vienna, Austria. She and colleagues have been assessing how much gas was vented during the eruption, based on data from a network of remote sensing and in-situ instruments established shortly after the event began. As well as the predominant species, SO2, the team estimated just over 6.5 million tonnes of carbon dioxide was released, together with roughly 110,000 tonnes hydrogen chloride. Bardarbunga-Holuhraun was one of the biggest effusive eruptions in Iceland’s recent history, spewing more than 1.5 cubic km of lava – but it was still quite tame compared with earlier entries in the record books. The infamous Laki event of 1783-84 threw up 15 cu km of lava and probably produced some 110 million tonnes of SO2. Its effects were felt far and wide, with parish records in England at the time reporting large numbers of deaths that have since been attributed to respiratory complications, to the harsh winter that followed the eruption, and to famine. On one level, it may appear surprising that more health complaints were not reported following Bardarbunga-Holuhraun. On occasions, the concentration of some of these gases far exceeded what normal air quality limits would deem acceptable. In Iceland for SO2, this is 350 micrograms per cubic metre. The highest, albeit short-lived, peak in the country was measured in Hofn, which is a town about 80km from the eruption site. Local instrumentation registered 21,000 micrograms per cubic metre. And in the capital Reykjavik, it got above 2,000 micrograms per cubic metre. "It is important to note that there was a very effective response by the civil protection authorities, in letting people know what was going on and giving them advice, telling them to stay inside when concentrations were high," observed Magnus Gudmundsson from the University of Iceland. The UK took a particular interest in the eruption. Ministers have put a Laki-like eruption on their list of risks that could bring major disruption to the country – should there ever be a repeat. The Met Office and university teams took readings as the plume of SO2 from Bardarbunga-Holuhraun spread south across the Atlantic. Its signal was quite easy to pick up now that clean air legislation has largely removed the gas from the pollution that can be detected on a day-to-day basis. Nonetheless, a peak above 500 micrograms per cubic metre was detected at a measuring station in Ireland. Encouragingly, modelled expectations of where the SO2 should have moved matched the observations via satellite. "This has been a good test case and has come at a very interesting time because ministers are very keen to learn more about these effusive, gas-rich eruptions," explained Claire Witham from the Met Office. "Even a small event on Iceland might have an impact on the UK, and this event perfectly demonstrates that this is the case. And the monitoring network has shown that it is well capable of giving us the information we need," she told BBC News. The UK Met office has been working with various groups to understand how gas emissions from Icelandic eruptions could transport to Britain and the rest of Europe. The left-hand image shows the distribution of SO2 from Bardarbunga-Holuhraun on 5 September last year. It is data acquired by the OMI instrument on Nasa's Aura spacecraft (data courtesy of Nicolas Theys at the Belgian Institute for Space Aeronomy). The right-hand image is the model simulation for the same day (figure courtesy of Anja Schmidt at the University of Leeds). Some of the sulphur dioxide will have mixed with water in the atmosphere to produce acidic precipitation, and values down to pH 3 were recorded in ices on the glacier network that surrounds Bardarbunga-Holuhraun. "This contaminant is trapped in the snow and we will have to watch what happens when the snows melt," said Dr Barsotti. "What will happen to the rivers and the aquatic system? It could come through as a pulse later, and we still need to monitor and evaluate this."